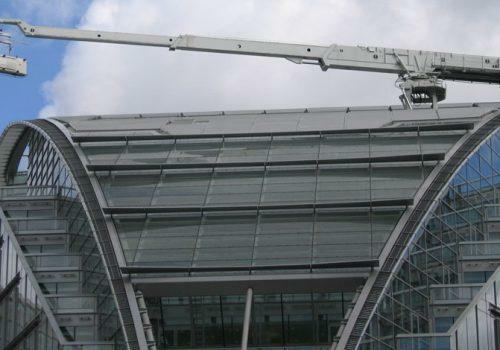 PTSG were commissioned to design and supply the external façade access and maintenance equipment to clean and service the external envelope of Cardinal Place in the centre of London. The exciting redevelopment was designed by EPR Architects and comprises some 46,920 sq m of offices in two buildings and 12,450 sq m of retail and restaurant accommodation, each with their own bespoke BMU equipment. Building 1A supports a roof mounted power trolley complete with telescopic jib and suspended platform traversing on a twin rail. The trolley chassis frame ensures machine stability even under high wind conditions. A mast that supports the telescopic jib is mounted on top of the parallelogram elevator, which in turn, is mounted on the chassis to support, raise and lower the mast. This is then capable of raising the telescopic jib out of it’s storage location, above the roof and into it’s working position. The mast also incorporates a hydraulic ram to luff the telescopic jib over the sloping roof. Building 1B also supports a roof mounted power trolley complete with telescopic jib and suspended platform traversing on a twin rail system, a telescopic mast is mounted on top of the chassis. The mast is incorporated with a hydraulic ram to raise and lower the inner mast and uses a power-slewing ring at the top so that the jib and platform can be positioned around the perimeter of the building. The articulated levelling system is to maintain the correct mast vertical and jib horizontal positions at all times, especially when the machine is travelling up the inclined track. Neither access system spoils the aesthetics of the buildings due to specially designed garages with sliding louver roof panels.